You needn’t be a CSI to get the rug spotless again after an accident. Blood happens. Not often, hopefully, but when a kid skins a knee and lays wailing on the living room rug, or the dog catches his paw on something sharp and leaves a bright red trail, you need to act immediately. Immediately after you administer first aid, that is! Follow these steps, stat, and your carpet—any pile, any material—will be clean and fresh again. And if you didn’t notice a drop till it dried, there’s a technique to tackle that too. Gently blot the affected area with an absorbent paper towel to remove any excess. Be careful not to scrub or rub, as this will spread and worsen the stain. Mix a few drops of mild liquid dish detergent with a couple of cups of cold water in a bowl or small bucket. Be sure to use very cold water; hot will set the stain into carpet fibers, making the frightful discoloration nearly impossible to remove. And be stingy on the number of drops of dish detergent you mix in! Soap that remains after cleaning will attract dirt, replacing the blood stain with a dark spot. Wet a clean white rag or cloth (an old T-shirt works well) with the cleaning solution and gently sponge it on top of the stain, again taking care not to rub or scrub. Continue wetting the cloth and blotting the stain, until all the blood comes up. Depending on the size and depth of the stain, you may need to repeat several times. With a dry section of cloth or absorbent paper towels, blot the remaining water from the carpet to dry it as much as possible. If it’s a large area, you might want to bring a fan into the room to help circulate the air or use a hair dryer on cool setting only. 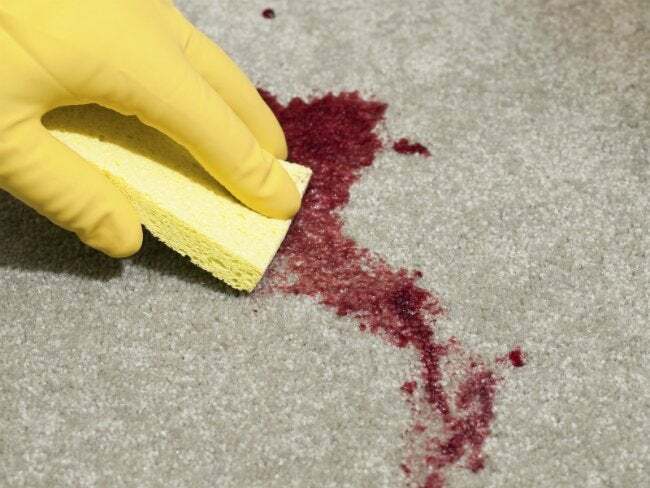 Drying the area quickly reduces the chance that any blood set deep down in the carpet pile will wick up and become visible. 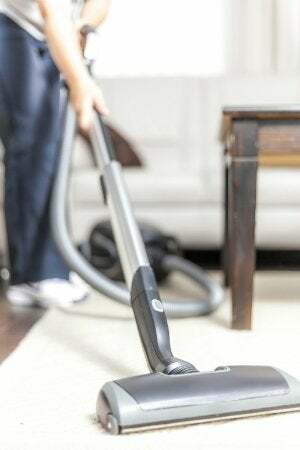 Take a clean, stiff brush to the area and brush firmly to crumble the stain, and then vacuum thoroughly. Proceed by jumping to Step 2 of the method outlined above (for fresh stains) and continue through to the end for stain-free carpeting.